Overall a beautiful course on a local bike path including some City running thrown in. Absolutely perfect day for running with a start in the low 40's and finish in the low 50's with fog to start then sunny. I don't think it could have been better running conditions. Registration was very simple. 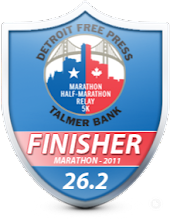 As with all the marathons I've run(this was #4), the race had a website to help you register and give you information. It also had a Facebook and Twitter page to help keep you updated on the race information. I signed up through Active back in December(believe it or not). In fact, my number was a low one - 220. In addition to Facebook updates continually, the race director also put out a newsletter with updates throughout the training cycle. He even sent them daily the week of the marathon. Great, great information and motivation by the race staff. It made you wish you lived in Grand Rapids with it's great running support. My running buddy and I started our day driving over the day before the race in style in a new Cadillac CTS he borrowed from his employer. 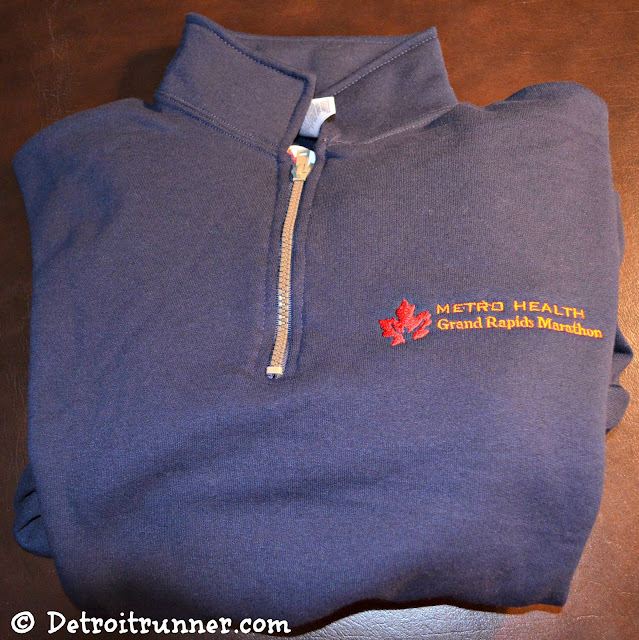 If you're going to go to a marathon, you might as well go in style. Packet Pickup was easy as well. It was located inside of the YMCA in downtown Grand Rapids. 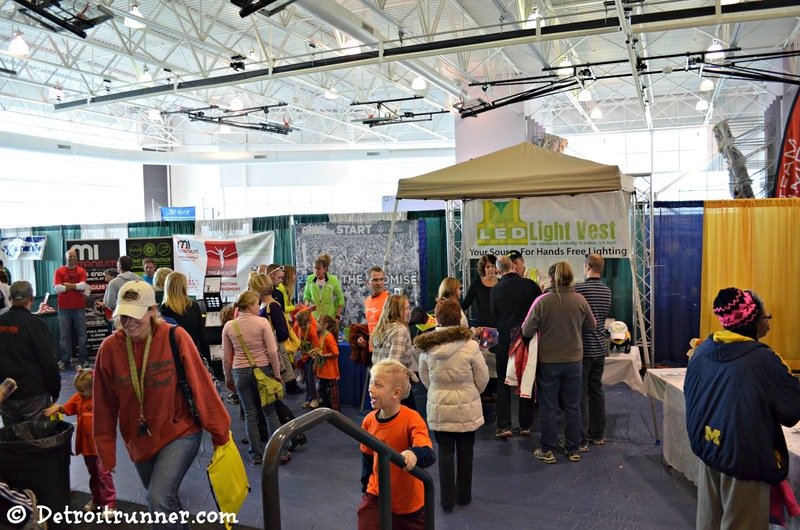 You could come to the expo on Saturday, the day before the race or you could even pick up your packet race morning. 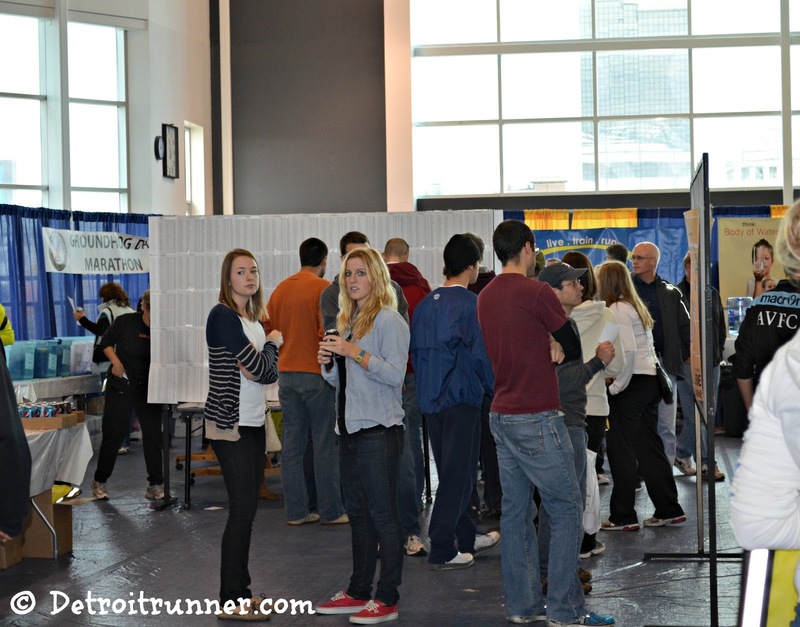 I think it's pretty rare to have race day packet pickup these days especially when there is an expo tied to the marathon. It was nice to know we could have drove in that morning if we wanted. I've actually skipped running a race I wanted to run because I could not pick up my packet the morning of the race. 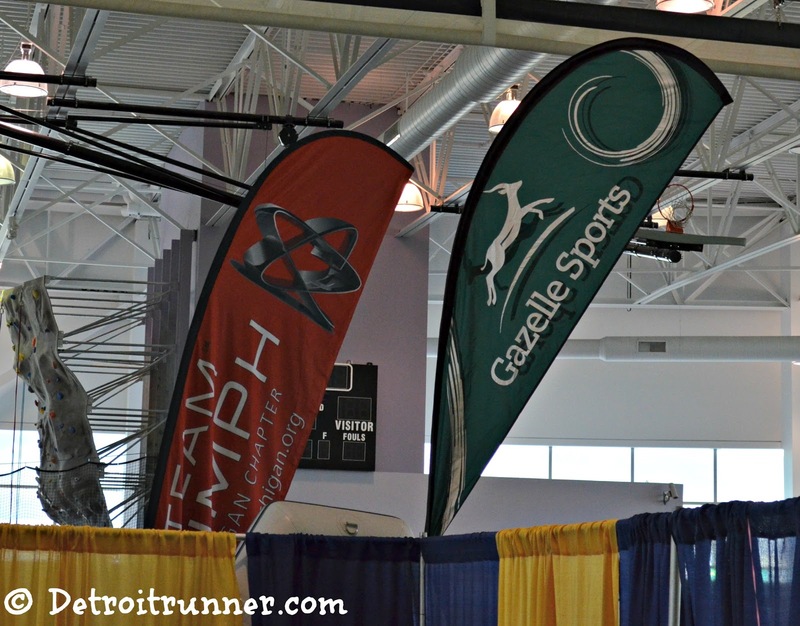 Given I'm about 2.5 hours away from Grand Rapids, my running buddy and I drove in the day before to go to the expo. It was nice to have the option of driving there that day which I could see us doing also but I prefer to get a good night sleep before. Because this is a small marathon by marathon standards(1585 finishers), the race expo was similar to a half marathon I've done(Brooksie Way). Nothing huge but it was nice to see some of the vendors. I love touring the expo for freebies/coupons and looking through marathon merchandise. I picked up a marathon sweatshirt for only $30. 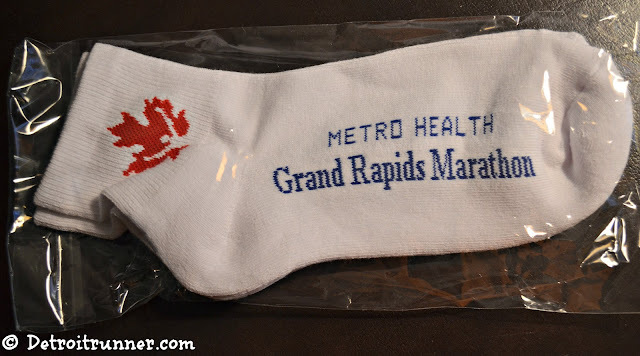 Not a bad deal in my opinion as it probably would have been $90 at a major marathon. They also had last years shirts you could buy and they had lots of other shirts to pick from too. 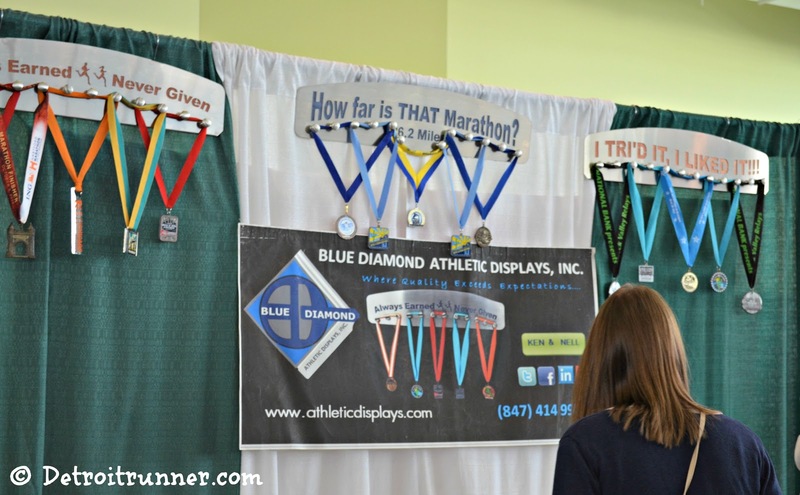 This was a new vendor I've never heard of that sells race medal hangers. They were quite nice. Also, New Holland Brewing was one of the sponsors of the race so they were there selling merchandise too. They also sponsor a weekly beer run as well which is a great idea. 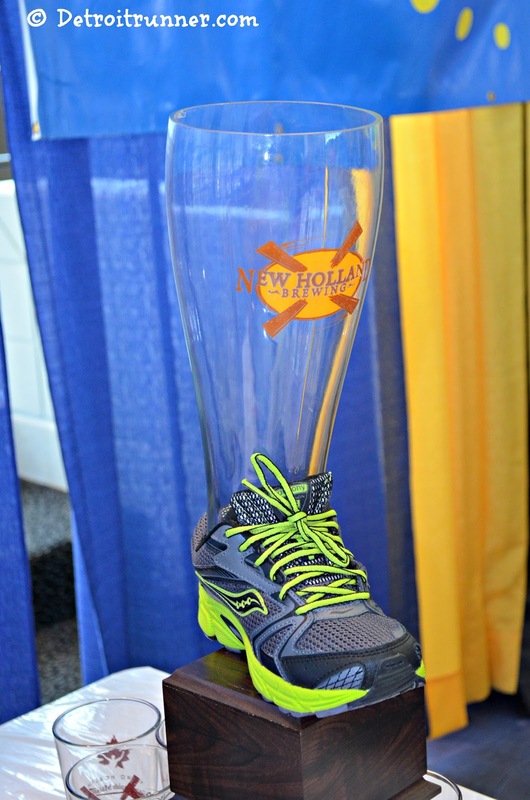 Take a look at this huge beer glass in this running shoe. Ha! 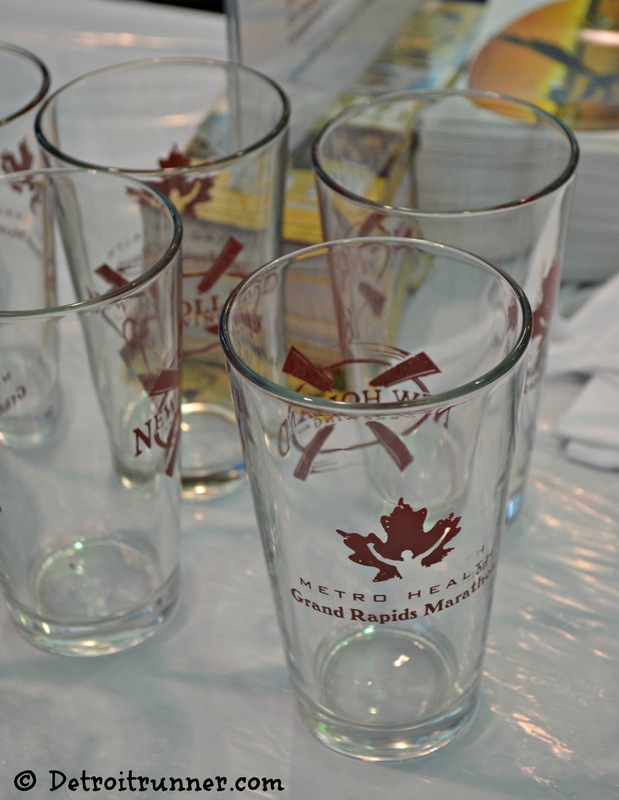 The marathon was also selling beer glasses as well with their logo on it. I've got a couple beer mugs from races. It's a nice reminder of the race but how much running stuff do you really need? You could go crazy at these things. 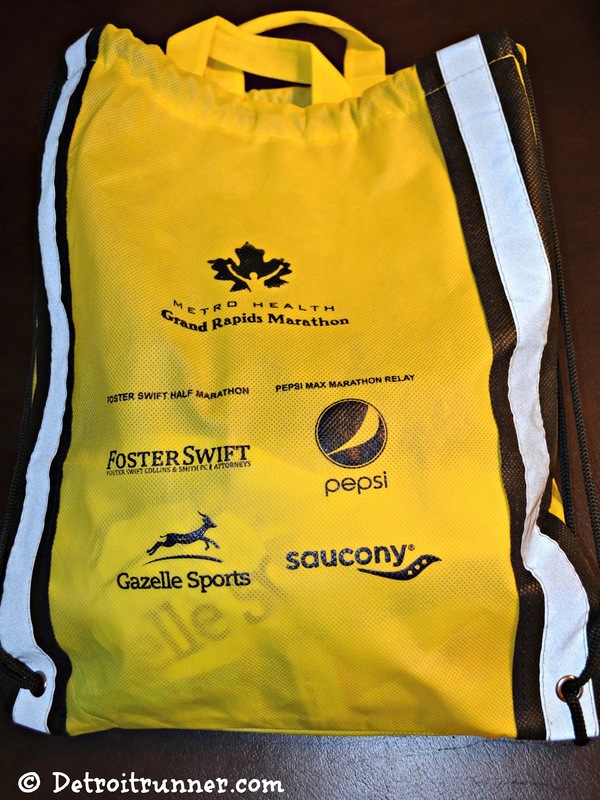 Packet pick up bag - really nice! 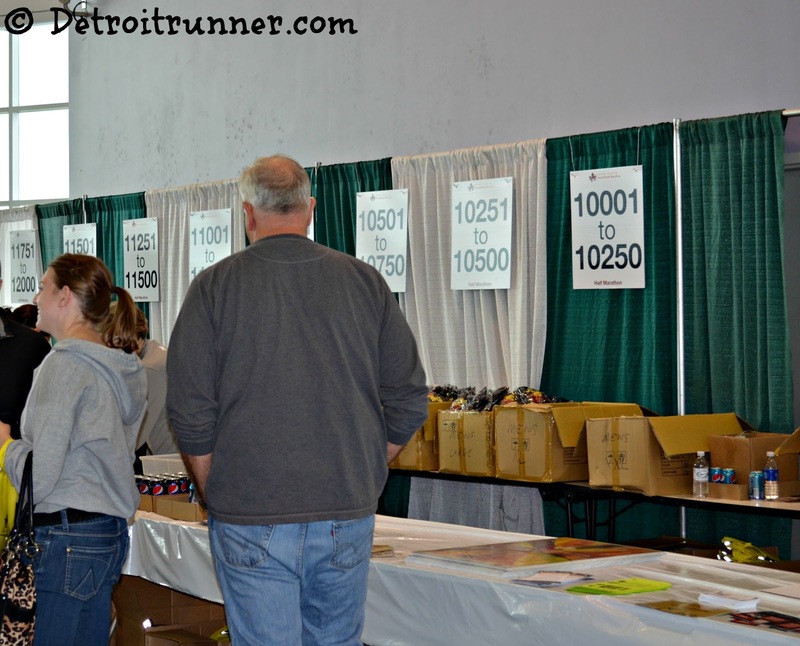 Also in the same area was the pace groups where you could get a race bib with the time you wanted. 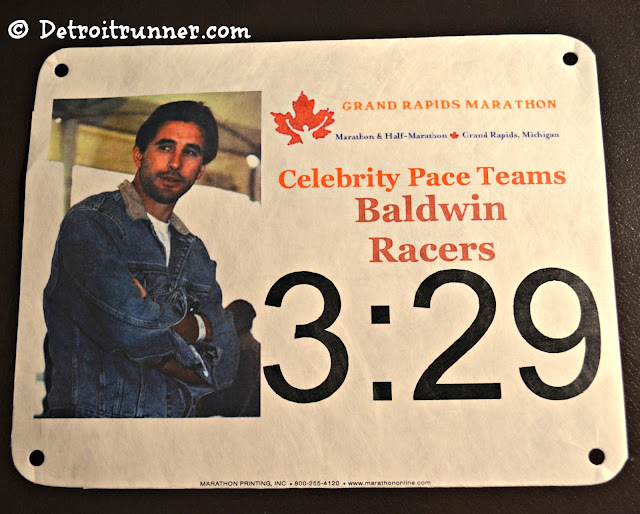 I actually did pick up a race bib for the 3:29 group which was the Baldwin Brothers group. The race has the only Celebrity marathon pace groups in the country. You sign up based on some celebrity's marathon time. Want to run what Oprah ran? Sign up with the 4:29 group. Here's the bib I got but I did not end up wearing it. Celebrity pace group - cool! After I picked up the pace bib, I got a quick picture with the course map and we were done with the expo. Overall, the expo was planned out well. As is typical, you needed to go through all the sponsors in order to get to your packet. The next morning we made our way to the race. We stayed in a hotel about 7 miles away so getting there was a nice short drive. There were plenty of options for hotels and very reasonably priced. The start area was right next to the YMCA where packet pick up was. Because we had been there the previous day, it was very easy in the dark morning to find our way. Some of the roads were closed but we found parking(free) within couple hundred yards from the start right on the campus of Grand Valley State University which is a really nice downtown campus. 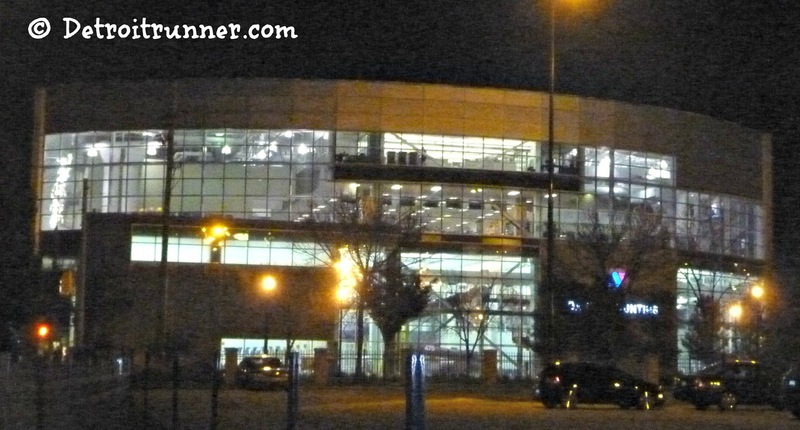 Downtown Grand Rapids YMCA - it was huge! The YMCA was huge(3 stories) and because of this, many of the runners were waiting around inside the facility. It made it really nice to be able to stay inside from the cold morning while we waited for the race to start. It was also nice to be able to use a regular bathroom. We got down there about an hour ahead of the start time, and before waiting, we checked out the starting line. As you can see, I've got my throw away clothes on to stay warm before. Because we were waiting right next to the start line, about 15 minutes before the race started, we headed out to get in line where they did the national anthem to get things started. Overall, a well organized start, plenty of bathrooms both inside and outside. The race sounded a horn and we were off. I didn't bring a camera but if you click HERE, you can see some amazing pictures of the course by Rudy Malmquist on Flickr. Since I was with the 3:29 pace group, I was fairly close to the start line. There were probably 20+ people running with this group so it was nice to run with so many people. It also helped me keep pace, a pace I probably had no business running with but I was determined to do my best. 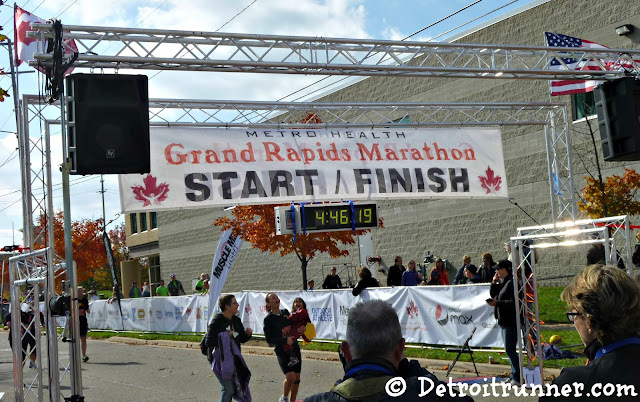 The course starts out in downtown Grand Rapids and heads into an industrial area. Not too scenic to start the race but not much you could do. The prize in the course was when we got out of the city and then started on the many paths we ran. Much of the course was on a bike path and along the river so there was no worries in regards to traffic. The areas downtown were well guarded with helpful police to keep us safe. I really enjoyed the course as it wound through the park areas near and in Grand Rapids and along the river. There is a slight slant to the bike path that may have bugged some people but I didn't think it was too bad overall. A very scenic area, we had fog in the beginning of the race which was really beautiful. Millennium Park is much like Stony Creek that I train at so it really felt like home. If I lived in Grand Rapids, I'd want to be close to this park since it's such a great area to run and you feel far away from the city even though parts of it are near the freeway. While crowd support was not huge, I was not expecting hardly anything. There were, however, pockets of people throughout the course near the turns to cheer people on. The elevation of the course was overall flat except for a few rolling hills. 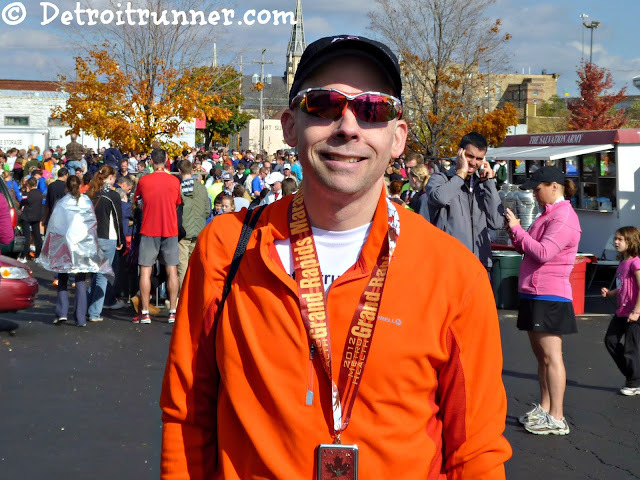 A great course to try and BQ or obtain a PR(which I happen to do). As we continued to go through the course, about mile 8 is where the split from the half and the full pulled off. I knew I was doing the full but mentally it's hard to see people turning off knowing they only had a few more miles to run. Ha! About mile 17, I took out the headphones. I really needed some motivation. My original plan was to take them out at mile 20 but I just couldn't wait. I think this really helped me and I used the headphones to zone out up to about 25.5 miles until I saw the crowd at the finish line. 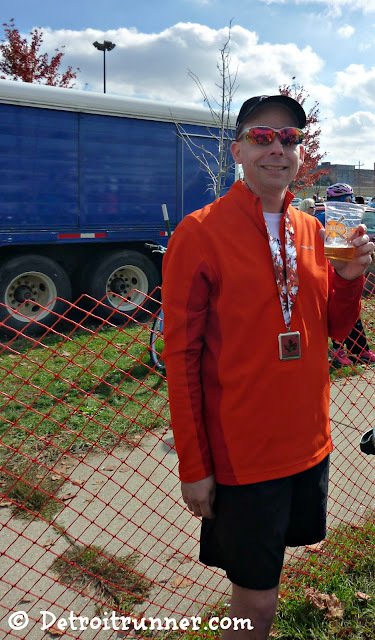 About mile 18, the course had pickle juice. It's supposed to be a good source of salt and other nutrients to help you replenish your fluids. Believe it or not, I figured what the heck, and drank it. I was starting to have a cramp in my leg and forgot to bring salt tablets(which I did train with) so I just went for it. I figured I was in unchartered territory with my pace so why not throw in something new too, huh? Crazy, I know. I was able to maintain the pace with the pace group through about mile 19 when I started to lose the group and slow slightly. After I hit mile 20, I couldn't see them anymore and knew that my goal of 3:30 was not going to be. 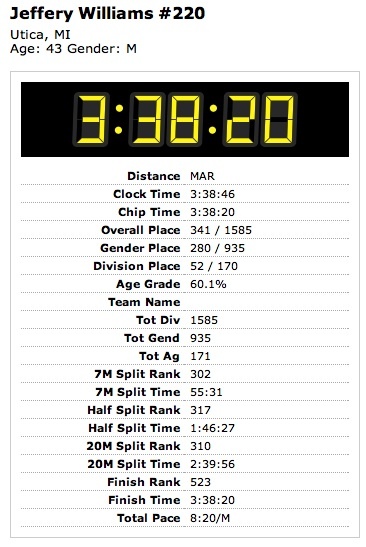 The biggest difference in this marathon though was I was not going to accept failure - meaning I would not accept less than at least 3:45 which was my mandatory goal. As I got to mile 22(for me, it's my achilles heal), I saw my first 9+ minute mile. I was devastated! All this training and I still slowed! As I was pacing through the next four miles, I did what I'm sure many runners do and started to calculate what I need to get to X time. I was figuring I needed to be around a 9 minute pace to be in the 3:3x time but I didn't have the power to think clearly. The only thing that was clear is that my mind was not going to win this time and I would continue to push my body more than I ever have. Sure, I wanted to walk, and I saw several runners at the end walking but I would not let myself walk or even slow down as much as I have in the past. I fought it out with my slowest mile being 9:35 pace. Every mile at least under a 9 pace with only 5 miles over 9 pace. Overall I was very happy with my results. I gutted it out to try and get to 3:30 but didn't let it bother me that I could not get there. As I neared the finish, the crowd was much larger than I thought it would be and it helped carry me towards the finish line. As promised, Don Kern, the race director was there to shake my hand at the finish as well as shake the hand of EVERY marathoner that day. Incredible. So here's the dirty details on the splits. Note that my Garmin time is slow by about 30 seconds. That's because around mile 24, I had to stop and loosen my shoe because the top of my foot was hurting so it took a little time to get it loose and tied again. My Garmin was set to auto pause so it stopped when I did, but of course, the timing chip didn't stop. All the aid stations were well stocked and the volunteers were incredible. They shouted and cheered for the runners and really helped. Some great aid stations indeed. The finish area was located in the same spot as the start area right at the YMCA. Because it's a smaller race, the race allowed runners to run with their families if they wanted near the finish line. I think it's great for moral and really gave a sense of the family values that the West side of the State has in it's heritage. A really nice touch. I also got a chance to say hello to Steph from In Steph's Shoes who ran with her Dad and a couple of his friends, one of which BQ'd his race which was the main reason they were running to help him out. Awesome! Steph also BQ'd as well for 2014 - of course!! Again, the finish was well laid out and once you crossed the finish line and shook the race directors hand, volunteers were there to hand you your medal and your space blanket to keep you warm. It actually was really nice(warm) at the finish line and you really did not need the blanket. From there, you went through the food line which had all kinds of food including - Muscle milk, water, oranges, apples, bananas, bagels, yogurt, chips, cheese sticks, and ice cream from Culver's! Wow - it was one of the most stocked race food selections that I've ever seen at all the races I have done. 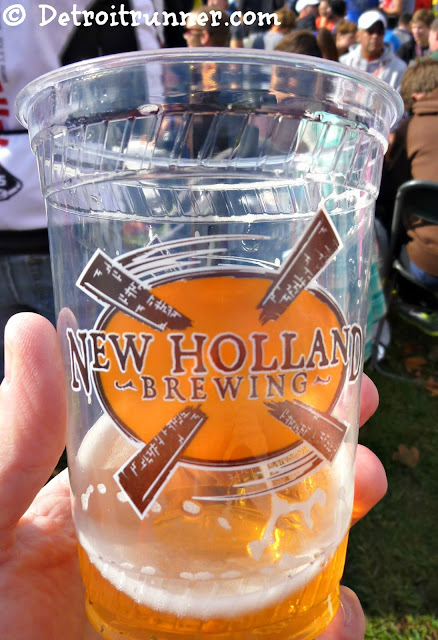 To top it all off, once you made your way through the finish line, you could also get chili from Wendy's and beer from New Holland Brewing Company(great beer by the way). My running buddy and I had pretty much everything there was to offer. In addition, the Salvation Army was there offering free(donation) food to the runners including Hot Dogs, chips, cookies, and popcorn. Plus, the local running store was offering free coffee too! We left the race with plenty of junk food in our stomachs. We were able to pick up our gear at gear check and I was able to change into something a little more comfortable. Lots of people drinking beer! I have to say that this was not an inexpensive marathon. $90 was the lowest price you could get it for but I would say that you got so much in return, it was well worth the price of admission. You received full course support, a race expo, a great packet pickup bag(show above in yellow) a race medal, a race tech shirt, marathon socks, a 26.2 sticker(pictured at the top of this review), a race poster, Xact race timing so you could get results e-mailed/Facebook/Twitter to your account(a great feature by the way that all races should have), an awesome finish food line with an incredible selection including beer and a well laid out course. 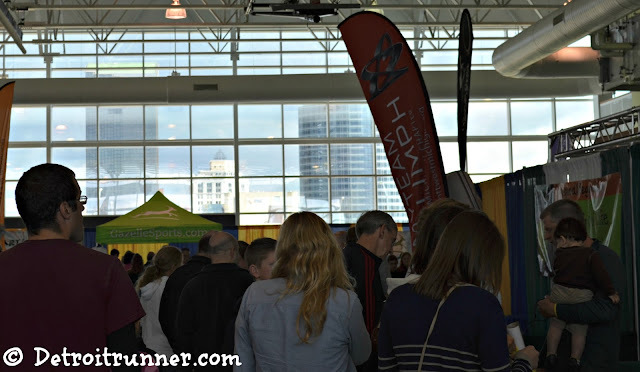 The race had good organization as the expo was well planned, the location was perfect, the start/finish line areas were laid out very well and organized good. 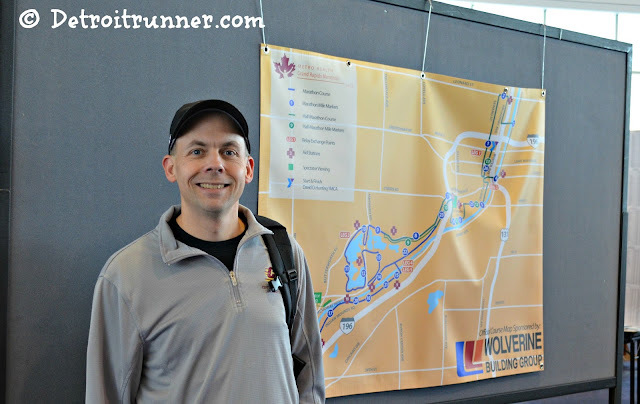 The registration was easy, the packet pickup had options, the course was well supported with volunteers and police, the race started ON TIME(a big pet peeve for me when it doesn't). It's very clear that the race is run by runners and they know what runners want. The only issue we had in regards to organization was parking. Not that it was the races fault since they had parking all spelled out on their website and newsletter but the race morning we went to park but ended up in a Burger King lot and had to leave. Fortunately, a volunteer directed us exactly where we needed to go and it worked out great. So would I run this race again? Yes! I really enjoyed the race overall. If you don't like small races or you want huge crowd support, this is not the race for you. If you like a hometown feeling, this is the race to run. As I said, it's also a perfect BQ course since it's not crowded. I'm sure I'll be back to run this sometime in the future. Marathon #4 completed with my running buddy! Great Job on a Huge PR!!! You know, a pace band with the splits for your "mandatory goal" eliminate the need for doing mental math when your mind's in a marathon fog. :P (PS: congratulations!) I'm planning on the half at this race next year. Haha. Yeah. But then I'd be focusing on the 3:45 instead if focusing on just pushing myself even faster. Half - come one! You've got another marathon in you! Great recap. Look at that pace!!!! Dude, I am totally impressed with your time!!! Those extra long runs really paid off. What an awesome race it was for you. You did a great job! I hope I can do as well as you come this Sunday. Good luck Sunday Jose. I hope you meet your goal. 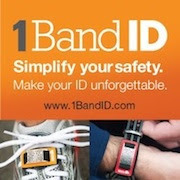 Sounds like a great race to try - great swag as well! Great recap! Sounds like a great race! Glad you enjoyed it especially since I had been blabbing what a great experience I'd had. And as long as this PR sticks, you wont' be able to help but have fond feelings for GR. Great recap, whoever takes your pictures does a damn good job (yes, I know it's you) and a huge, huge PR leap. If you were an elite runner with that kind of PR jump, they'd be accusing you of doping right about now. Big improvements = doping huh? Ha! Hey, you two guys look like twins! If they ever change the date of their race I would love to be there. Well done and a fantastic review! Really awesome event for sure. Lovely photos! Congratulations on the huge PR! Wow! And awesome swag. Congrats on your PR!!! This definitely is one of the best run races around (and I'm not just saying that because I'm friends with some of the staff). They really do know how to treat you well and the bling rocks. I ran the 1/2 in 2010, the full in 2011 (my first and only) and this year I ran the relay. 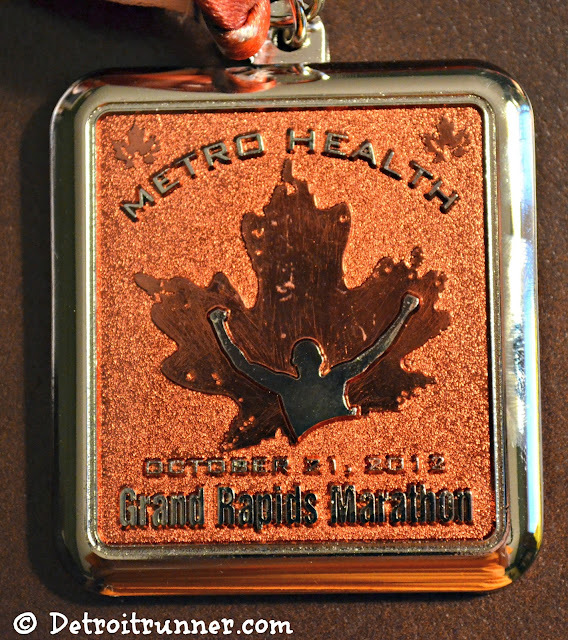 I'm actually thinking of giving the Detroit half a try next year (it stinks they are always the same day as GR) since I now have bling from all 3 GR races. Once again, congratulations on the HUGE PR!! Almost a 21 minute PR?! Incredible! Always great to see you and congrats on another BQ! Congratulations!! Great race and time! Awesome racing! Congrats on the amazing PR!! I'll have to put this on the list for some day. I have a personal grudge against New Holland, though. PS you don't have to run the race I did you can always do it as a 5 day hike!!! Coach - thanks again for all your encouragement through the training cycle. Your comments helped me get there. I agree with you that 3h30 is within reach. Great job!!! I'm a GR local and have done this race a few times. Always glad to hear stories from others who enjoyed the race. In fact, last year I signed up as a Lifetime Registrant so now I can race for the rest of my life without having to pay. I only have to race 4 more times to recoup the cost of the lifetime registration. Awesome job and nice write up! 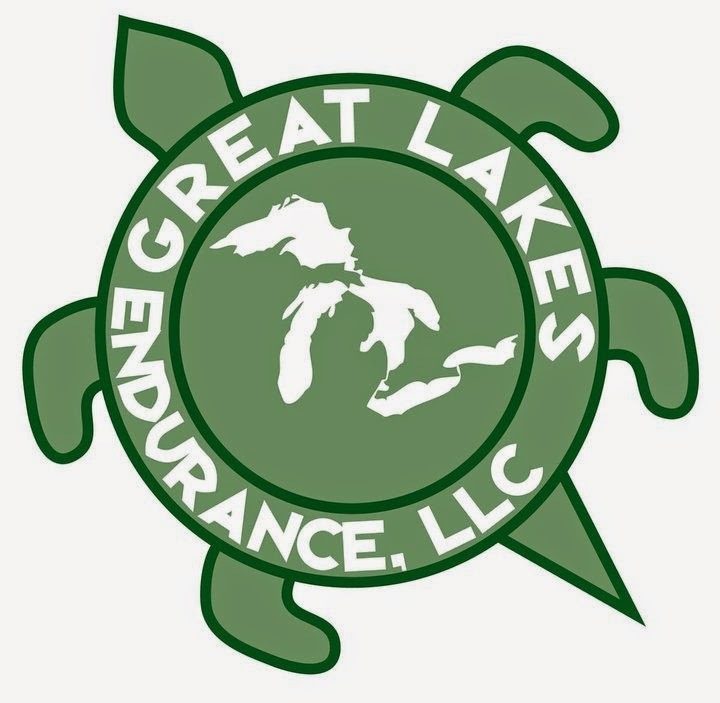 :) I live in GR and you did the area/course justice. I ran the half last year (my first) and was very impressed with the organization. Congrats! 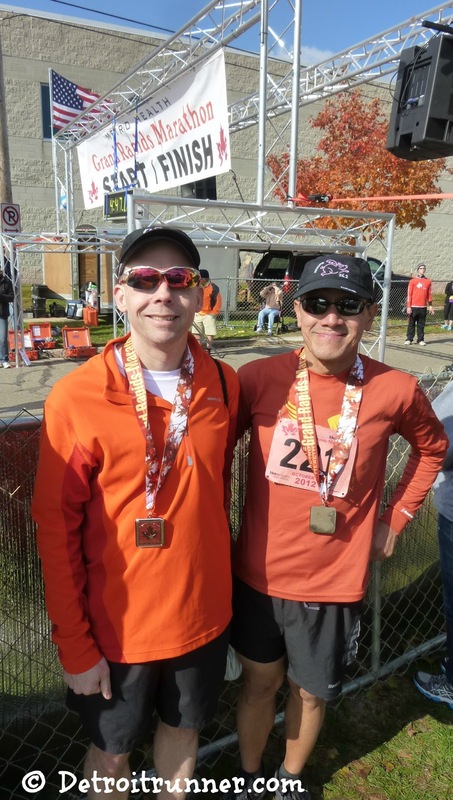 great writeup Jeff and nice finish time as well. Congrats Jeff! Looks like it was a great time! Good job and PR!! I can identify with what you said - "makes you wish you lived in Grand Rapids"!! I've said that quite a few times! 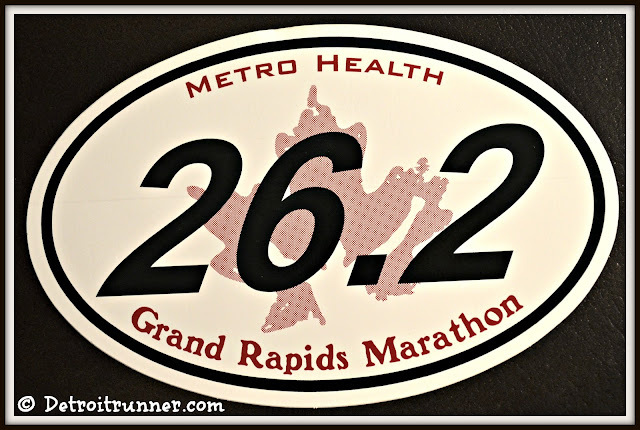 I've run the half and whole marathon and the River Bank Run, a spring 25K which is also a great course. I still get emails and FB updates from both races; there is always some cool informal group running event going on over there (such as the beer runs) and they have huge turnouts even on weeknights!! (they post lots of pics) It seems like the best city to live in if you run!! Are your photos copyrighted or can I "steal" the one of my friend crossing the finish line with her daughter? Great race recap. I ran with the 3:29 group and saw you quite a bit. I agree I don't think there could've been more perfect running weather. This ws my first full and a BQ for me! I loved every minute of the day. Thanks for recapping it so well. CJ - e-mail me your e-mail address and I'll send you a copy that does not have my website name on it. 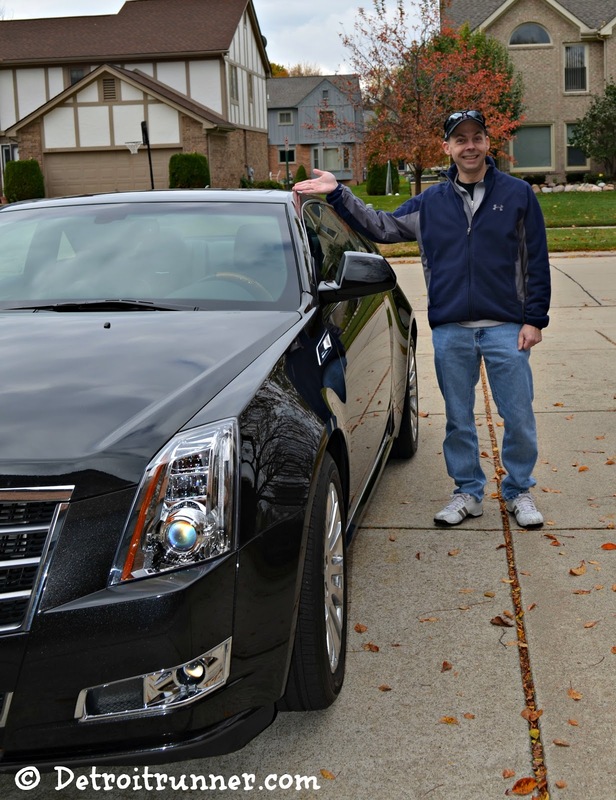 A Cadillac is the way to go. Specially for a marathon like that. I hope that you did great in that Marathon. 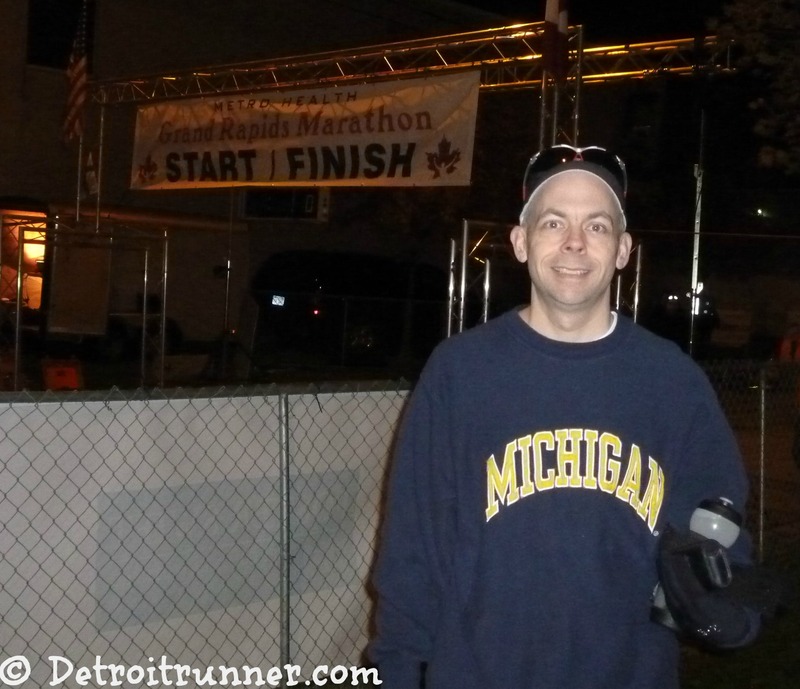 JackRabbit "Detroit Runner" Cap Winner!!!! JackRabbit Cap review and Giveaway!!! I have to have a goal?